"Try again," Coris coaxes Venati patiently. The falcon regards the stallion with a look of exasperation in the gold-rimmed eyes, but blue wings sail once more as the bird climbs the sky. Coris squints as he looks up, watching the beautiful animal as it turns and dives rapidly. Silver flashes as water sprays up, catching the light in a blinding fashion. Coris is forced to look away, only peeking out from his lashes as wing beats buffet the wind near him. Empty talons meet his eyes. He frowns. Venati being a red-footed falcon is not a fish-eating bird and does not naturally know the tactics of fishing. Coris assures him that he will earn given time and practice, but for a bird that's known how to hunt nearly as well as breathing, not succeeding has his confidence depleting rapidly. 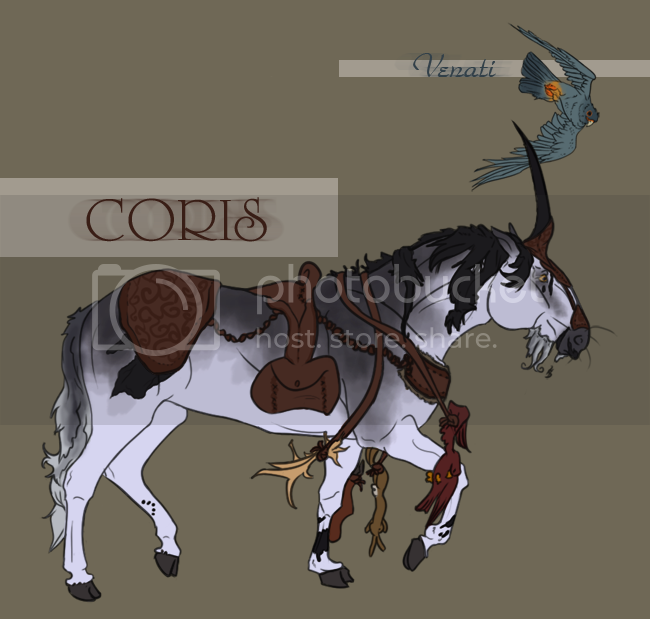 The smokey stallion hopes to make a break through, which will provide the bird with insight into himself, as Coris hopes to teach him many a new thing in his life time. The fish would also be useful, they have bountiful oils he'll need for his leather work. Wings flutter and Venati is climbing again.